By creating, we opt for an eco-responsible approach, by valuing natural and renewable materials on the product and also on its presentation. We want to avoid too important packaging, causing useless waste. Perfumes, candles, home sprays and soaps are presented in a through-colored recyclable paper folding box. The box and the bottle are silk-screen printed, which consumes few ink. 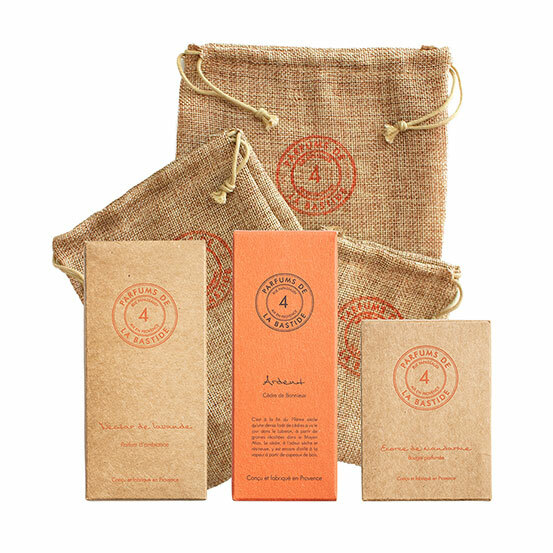 Every ordered product is delivered in its jute bag, hand-stamped with the logo, then packed in a tissue paper before being slid in its kraft box.